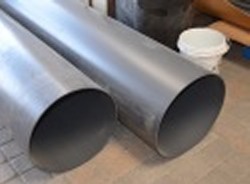 Cut PVC duct pipes or hoses are non-cancelable and non-returnable so please be sure you are ordering the correct size and length..
Thinwall PVC Duct Pipe. 20" OD (nominal), 19.60" ID (fits standard sch 40/80 and DWV fittings). Wall thickness: .172". Weight per foot if 8.14#/ft. Air ducting pipe, has printing on it and normal handling scuffs. Gray color. Not pressure rated for liquids. 10 foot length, straight, no bell. Must ship by truck. Min. shipping charge is $125 and goes up depending on how many pieces you order and your location. Subject to availability. We will email you a quote and you can approve or cancel the order. FOR LARGER PURCHASES OF THIS PRODUCT PLEASE EMAIL US FOR A QUOTE.